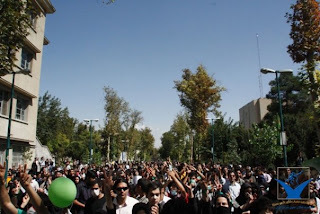 Over one thousand students participated in demonstrations, yesterday at Tehran University and today at Sharif University, as the new semester got underway. 'Iranian Education Minister Kamren Daneshju was visiting Sharif University at the time to mark the new academic year.' They aren't giving up.